B+R Architects have a philosophy of “making life and architecture an adventure”. Well, this is something they certainly achieve in the tropical designs of their residences, resorts, clubs and spas. Their projects are situated on the most idyllic locations all with an incomparable tropical flair. Established in 1999, BR Architects have a wealth of experience in this type of architecture, and are leaders in the field. Now imagine living in a home just like a tropical beach resort… must be amazing, right? 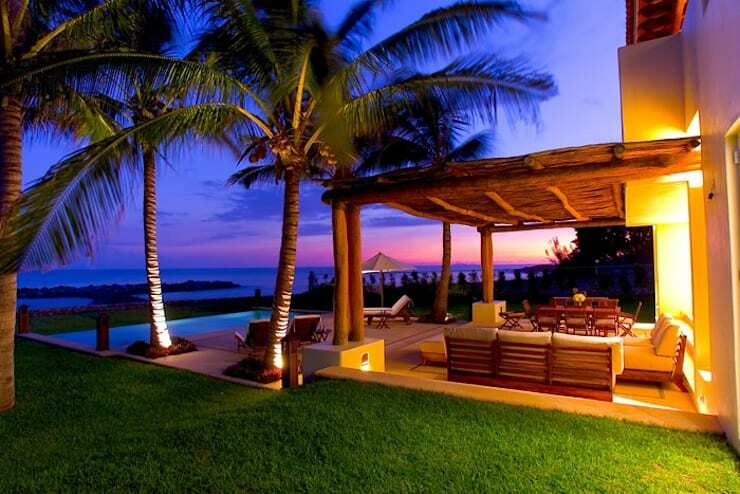 So today, we've decided to treat your senses with the stunning Casa Tortuga in Mexico. This charming home will transport you to a tropical dream of serenity and tranquillity. Let’s waste no time in exploring this residence in more detail. In the dim light of dusk we can see a golden mirage appearing in the intense blue sky and reflected in the clear pool ahead of it. The rectangular structure rises warmly from the ground, bathed in the gentle illumination of the strategically positioned lights on the exterior and in the interior of the home. The building is surrounded by tall and majestic palm trees that immediately renders the scene tropical. The stunning Casa Tortuga is a home that seems like a holiday resort, situated right near the beach with stunning views and an island atmosphere. Just looking at this image must conjure up nostalgia for vacations past or longing for those expected or imagined. Now just think how it must be to own a home like this! Pure bliss. 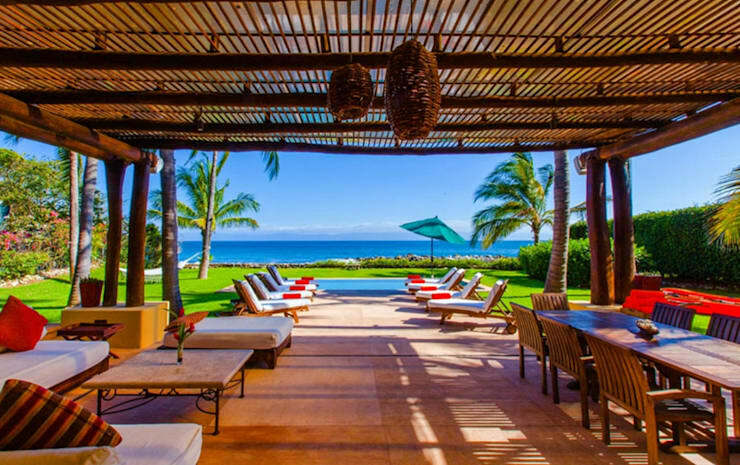 Here we catch just a glimpse of the home's veranda, the outlook to the porch and pool, and beyond that, the vast ocean. We're quite sure this view never gets old. Once again the palm trees so close to the beach need no assistance in creating a tropical atmosphere, but the rough wooden veranda certainly contributes to this image. B+R Architects have an ethic of working with the land instead of against it, and based on the reading of the terrain, the firm specialises in buildings near beaches. With this kind of reputation, it is not difficult to associate the firm with this kind or tropical design, and the house seems entirely suited to its natural, idyllic environment. Let us take a look at the lower level of the home's interior. As was also seen in the first image, this part of the house has large openings to the outside, as to promote the indoor—outdoor connection esteemed in homes near beaches. This large opening allows for a splendid view of the ocean (and beyond) from almost any spot on the floor, which is entirely open-plan. The beige marble floors bring an element of charm and sophistication without taking away from the neutral colour scheme of the interior. The woven furniture used in both the dining and living room areas of the space seem right at home in their natural surroundings, whilst contrasted with a few objects of decoration and comfort, such as the scatter cushions. Up to the bedroom to find more retreat-like spaces. 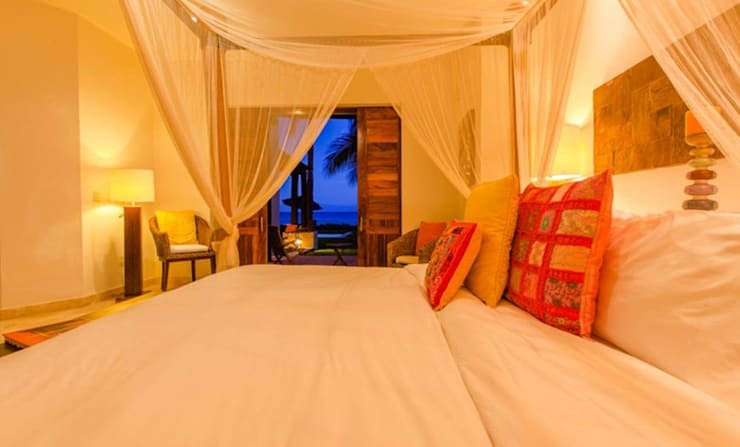 This master bedroom is a haven in which all the hours not spent on the beach can be passed in comfort. The large bed is decked in luxurious white bedding and housed beneath a shower of soft netting, with warm and colourful pillows to boot. To the rear of the room we see the walls painted in a cheerful yellow and wooden doors moving onto the balcony. With the doors open a beautiful contrast is created between the stark blue sky of the outdoors and the gentle yellow interior. What a dreamy bedroom! Here we can see a charming courtyard and space that expresses the homes beauty, even in the areas not basking in the glory of the ocean. To the back we can see a rough stone-paved wall, covered in front by more young palms. The bright green against the tonal wall creates a lovely natural look, which is exactly what the architects wanted. The flooring consists of textured stone slabs, and to the right we find a charming alcove with comfortable seating. Perfect for long reading sessions at any time of day. Walking out onto the porch of the home from the open-plan social areas of the home, we can definitely see how easy it may be to melt away in this sanctuary of the sun. The wooden porch of the home walks right out onto the concrete deck next to the swimming pool, which is surrounded by a brilliantly green lawn. Of course, beyond this is the wide blue see, resonating with the clear blue swimming pool. This is a back yard that caters to all family members' needs, whether it be parents lounging in the sun, or kids playing on the grass or in the pool. If you want to create this feel at home, check out how to: Inject Some Tropical Style Into Your Garden! On the front porch we can see a dining set and lounging area under the shade of the wooden veranda for when the sun gets a little too much. Everything you want from backyard and garden!